44 ¼ x 34 1/16 in. In 1855, Gustave de Jonghe moved from Belgium to Paris and exhibited regularly in the Salon for the next 30 years. The English translation of the original French title provides an interesting double meaning to the work. 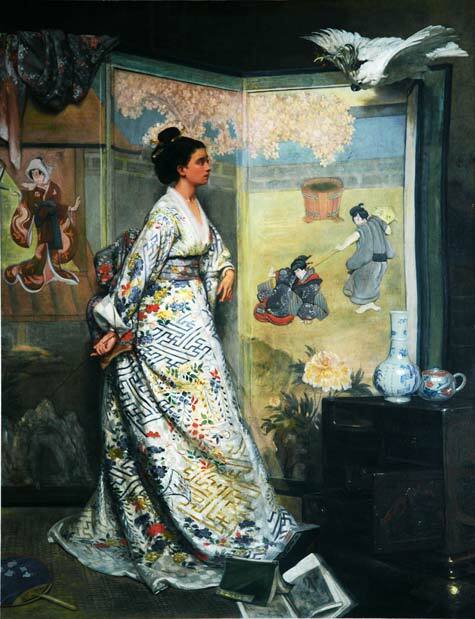 The woman, who clearly is a fan of all things Japanese, is the center of the activity in the painting. The Japanese fan, so prominently implied in the title, is merely a small object on the floor. The composition centers on the confrontation between the bird and the young woman which has, it appears, caused chaos in the room. It is uncertain whether the woman is disciplining the cockatoo or the bird is threatening her. The violent scene in the Japanese screen behind her reinforces the impression of a conflict between two antagonists.